After you’ve had delightful BBQ feast with your loved ones; it’s time for a cleanup. And most of us really dislike cleaning a grill. But, why is that so? Perhaps you’ve been doing it the wrong way. Think about it for a second. Maybe you put in too much effort so you ended up cleaning a grill all day long. Maybe you’ve used tools cleaning tools that weren’t adequate for the type of grill you have and the grill grates corroded. Well, whatever the case, one is for sure – you could use some fresh tips on how to clean a grill. And we’re going to share some with you, so keep on reading. Gas grills can last you for years if cleaned regularly. Otherwise, rust and gunk can take over your grill. The good news is that keeping your gas grill in a good condition isn’t much of work. Here’s the best way to clean a grill. If not cleaned, grill grates can impact the flavor of food and cause flare-ups. That’s why keeping grill grates clean is so important. The best way to keep your gas grill clean is to brush the grates before and after grilling. Be sure to remove all chunks of food on the grates. Don’t be afraid to apply more force, the grates can handle it. For those stubborn chunks of food, you can use a metal scraper. One thing to point out here is to brush both the top and the bottom of the grates as the food and grease build-up on both sides. Burner protectors keep the burner mechanisms safe from grease so they can get very dirty. And this leads us to the next step – removing the burner protectors and cleaning them. After removing the burners, wash them one by one. Put a burner in a soapy bucket and scrub with an old sponge. After a good scrub, the protectors will look shiny and sparkling again. Now it’s time to clean the burners. If the burners on your grill can be removed easily, then you will clean them much faster and easier. You just need to rinse them with lukewarm, soapy water. On the other hand, if the burners cannot come out, cleaning will be slightly more complicated because you cannot see the whole burner. Instead, you can only wipe them with a damp sponge, assuming that you cleaned the bottom well. In this case, you will have to rely on your sponge. Each time you wipe the burner, check how dirty the sponge is. Now you need to clean the plates underneath the burners. These are easy to pull out, and also easy to clean off. Use a grill brush for that and be sure to remove all that you see. The last thing to clean is the edges of the grill. Use a scraper to get all the chunks to the bottom tray. Then remove the tray and clean it too. Well, congratulations! You’ve successfully cleaned the grill. Now, the only thing left to do is to put all parts back together. While beautiful, stainless steel can easily become stained due to various elements. So, keeping a stainless steel gas grill sparkling certainly requires time and effort. You should clean your stainless regularly, not only to keep it shiny but also to preserve its rust-resistance ability. But, before starting to clean your grill, it’s a good idea to check the manual. Not all stainless steel is made the same, and naturally, they require different cleaning and handling discoloration. Best way to clean grill grates is to use a stainless steel cleaner or a mild dish detergent mixed with warm water. Do not use harsh cleaners because they can damage the finish and weaken corrosion resistance. Also, do not use steel-wool pads and steel brushes for the same reason. Warm up grill grates for about 10 minutes. They should be warm, not too hot. Then clean the grates from the food and grease using a stainless steel brush (with gentle bristles!). Next, apply oil over the grill grates. You can do that by using a regular cloth. Use a soft cloth and soapy water to rinse the exterior. Then rinse with clean water and dry with a clean microfiber cloth. For stubborn grease and food leftovers, you can use this method. Follow the first step for “regular cleaning” method. After that, you’ll need soap, warm water, and sponge to thoroughly clean the grill grates. The last step is to rinse everything with a hose and then use a cloth to dry the grill grates. Since stainless is sensitive to the weather, you should buy a cover to protect your grill. You can probably get a cover from the manufacturer of your grill. If not, you can find it online. When it comes to covering a grill, be sure to do that as soon as you clean it. This way, the grill will keep looking good. A cast iron grill is a favorite choice of avid barbecuers. This type of grill is tough and resilient. However, this doesn’t mean this grill is indestructible. In fact, if not maintained properly, it can quickly become useless because of rust. So, when it comes to how to clean cast iron grill, you don’t have to worry about preventing scratches and damaging a shiny finish but rather preventing rust. Therefore, the first thing to do is to season your grill before using it. Apply a thin layer of vegetable oil. You’ll also want to do this every time you clean a grill. Speaking of which, a cast iron grill requires a thorough cleaning after each use. Don’t skip this step. The best way to clean a grill is while the grates are still warm. Wipe them with paper towels or a soft cloth. To remove food stuck on the grill grates, you can either use a wire brush or a nylon sponge. For food that doesn’t want to come off, use a cleaning paste. To make one of this, mix baking soda with water. Apply the paste with a sponge and leave it there for some time. After that, scrub the area. We are only humans – we make mistakes. Even if you clean your grill after each use with great care, you may forget to cover it or you simply didn’t use it for a while so moisture managed to get into the grill. As a result, rust developed on your grill. This problem can be solved, so relax. Here are some tips on how to remove rust from grill grates. The first step is to determine the degree of rust. If you don’t see much rust, you can get rid of it effortlessly. Moreover, you can do that by using natural solutions. But, if rust is deep, you’ll probably have to use commercial cleaners. These contain toxic chemicals and have to be used with great care. It’s best to ask a professional to recommend you the product and explain to you how to use it properly. Pour baking soda into a bowl. Slowly add wine vinegar and stir gently until you get a consistent paste. Use a sponge to apply the paste on the grates and leave it that way for about an hour. Then, clean the grates with a soft brush. After this, clean the grates with lukewarm water, wipe it dry, and then preserve it. Here is another way to remove rust from the grill grates. This one is great if your sink can accommodate your grill grates so they can lie flat in it. It’s really the easiest way to remove rust and clean the grates. Simply make a 50/50 mixture of white vinegar and water. Then, leave the grates to soak for an hour. Gently scrub the grates with a kitchen scrubber to remove remaining rust. Lastly, wash the grates with soapy water, dry them completely and also don’t forget to season them. Now that you’ve read these tips on how to clean a grill, it’s time to actually clean your grill. And on those days when you don’t feel like cleaning a grill (and there will be a time like this), just remember how much food will build upon the grill grates after few more uses. Why do things the harder way when you can choose to do the work now and make your life easier in the long run? Your grill will certainly be thankful to you for taking care of it. For serious now, don’t put off cleaning a grill and things will be much simpler and tastier. And you will enjoy grilling food every time. 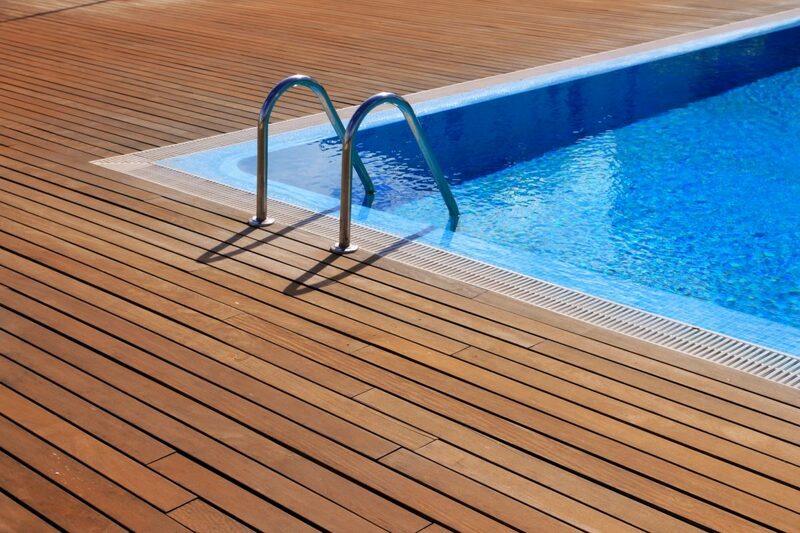 Different Types Of Pools – Which One Is For You?